Bach wrote the piece we call the "Bach Double" between 1730 and 1731, and even after nearly 300 years, it never gets old or tired, at least for this violinist (who has both parts memorized for the first movement and plays it with students very very often!). The first movement is part of nearly every violinist's studies, the second movement is pure gorgeousness and the third is just plain fun. 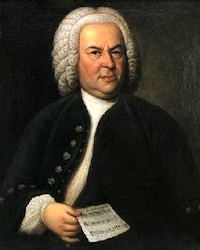 Bach wrote two parts that are equally challenging, and he even has the second violin open the piece. No one has to be the "underdog" in the "Bach Double"! Here, violinists Isaac Stern and Shlomo Mintz perform the "Bach Double." Not only was W.A. 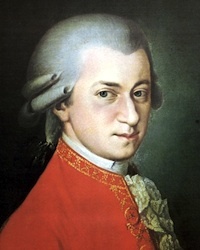 Mozart a fine violinist, he also inherited a wealth of knowledge from his father, Leopold, arguably one of the finest violin pedagogues to have lived. Written in 1775, Concerto No. 4 sparkles with good humor, energy and elegance. Here's a performance from the 2006 BBC Proms with Maxim Vengerov, UBS Verbier Festival Chamber Orchestra at the Royal Albert Hall, London. Vengerov plays his own cadenzas. Ah, the Bach Double. Yes the second movement is great, but the second mvt of the A minor is even better. And all the students play the first mvt of the Double because it's in Suzuki Books but the finale is more fun. Darn it, I've got to go get some things done and wasn't planning on spending 7:16 listening to the middle movement of the Bach. Once I clicked on it, though, there was no leaving until it was finished. I'm resisting the temptation to listen to either of the outside movements. I'm so sorry, Wolfgang. Please understand that this is not personal, and I am sure if you were presented with the same dilemma, you too would have to channel the wisdom of Solomon. Ohh, why did I ever vote and forsake you. What despicable luck caused these two to be on the same playlist. I demand a resolution. Of course it's Bach Double. It's Bach FCOL and I know people who don't like violin music love this piece. I recall one discussion my husband had with his Sinologist colleagues about the beauty of Chinese Erhu music. He told them to listen to Bach Double and then come back to discuss this again. That silenced everyone instantly. I must say, I enjoyed Vengerov's Mozart. What spark! Either Bach or Mozart are not my favorite composers, far from it. And as much as I think that Mozart was a genius, Bach on the other side was, I think more creative. Either way this was easy, and it is not even one of the "famous" or "better" concertos of Mozart.